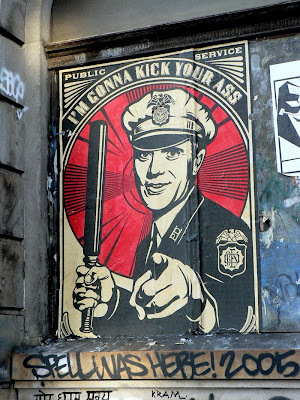 In the graffiti and culture jamming world, if there is one artist right now who deserves the title “King of the Streets” in my opinion that would be Mr. Frank Shepard Fairey. 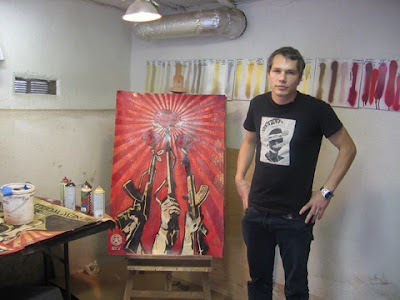 Most well known for his "Obey Giant" street posters and cool t-shirts, Shepard Fairey has carefully nurtured a reputation as a heroic guerrilla street artist waging a one man campaign against the corporate powers-that-be. I first met Shepard Fairey in person back in the spring of 1999 when Ron English, the BLF (Billboard Liberation Front) and me as a member of the now defunct art collective known as Cicada curated an art show entitled “20 Years of Billboard Liberation” which opened in San Francisco and then traveled to New York to packed houses. The night before the show opened in New York, Ron English, Jack Napier (founding member of the BLF) and I went for a celebratory drink at Max Fish, a popular bar among artists in the Lower East Side. There, to our pleasant surprise, we bumped into Shepard Fairey who just happened to be in New York that week and has just finished putting up a billboard in that area. That moment could not have been more appropriate for our all mutual encounter. We talked all night about the best way to alter a billboard, street art, politics, activism, etc. I ended up getting back home that night at 5 am. 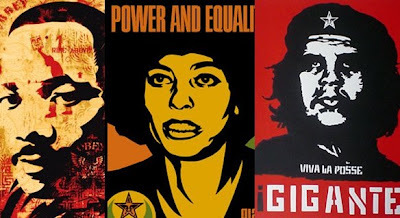 Shepard Fairey launched his career with a series of obscure street posters, stickers and stencils that combined the words "Andre the Giant Has a Posse" with the visage of deceased wrestling superstar, Andre the Giant. Fairey created the "André the Giant Has a Posse" sticker campaign in 1989, while attending the Rhode Island School of Design (RISD). 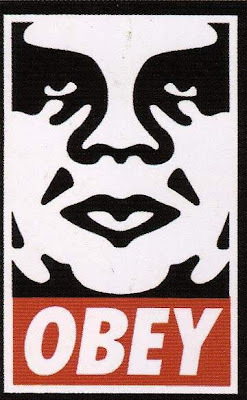 This later evolved into the "Obey Giant" campaign, which has grown via an international network of collaborators replicating Fairey's original designs. 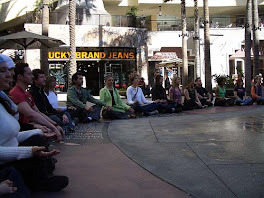 In a manifesto he wrote in 1990, and since posted on his website, he links his work with Heidegger's concept of phenomenology. His "Obey" Campaign draws from the John Carpenter movie "They Live" which starred pro wrestler Roddy Piper, taking a number of its slogans, including the "Obey" slogan, as well as the "This is Your God" slogan. Fairey has also spun off the OBEY clothing line from the original sticker campaign. He also uses the slogan "The Medium is the Message" borrowed from Marshall McLuhan. It took only a few years for Shepard to turn his stickers and hand-bills declaring “Andre the Giant has a posse” into a nationwide movement. No other street art/sticker campaign in recent memory has had as much impact as Fairey’s, yet he has empowered many to create their own takes on the art form. By the early 1990’s the incomprehensible images had become ubiquitous in major urban centers around the world, but in 1993 Titan Sports, Inc. (now World Wrestling Entertainment, Inc.) threatened to sue Fairey for violating their trademarked name, Andre the Giant. Fairey responded to the threatened lawsuit by altering his portrait of the famous wrestler, combining the new image with the word, "Obey. The supposed intent of the project, according to Shepard Fairey, was to: "stimulate curiosity and bring people to question both the campaign and their relationship with their surroundings - because people are not used to seeing advertisements or propaganda for which the motive is not obvious." Inc. (1997-2003) with Dave Kinsey and Phillip In the years that followed Fairey turned his talents in guerilla marketing to "the development of high-impact marketing campaigns." He founded several design studios including BLK/MRKTDeWolff and later Studio Number One (in 2003). In the last few years Fairey has taken his activist spirit back to his roots, with a street art campaign called "Be the Revolution" ( a series of anti war- anti bush posters) for the art collective Post Gen. According to some critics (Eric Lyle for one)Fairey has cynically turned graffiti culture into a self-promoting ad campaign, turning street art into a cheap hustle that is no different from corporate advertising. On the other hand, San Diego Union-Tribune art critic Robert L. Pincus says Fairey's, "is political art with a strong sense of visual style and emotional authenticity. Even in times when political art has ebbed, Fairey's has just the right balance of seriousness, irony and wit to fit the mood of the moment."